You are NOT going to believe this. Last post... I missed the deadline! If you've read some of my previous posts you will know... this is not the first time! :( I came close to tears this time too! Turns out the challenge was a WEEKLY challenge. I lumped it with my monthly challenges. Oh, well... lesson learned... after that little fiasco... I went and double checked ALL my challenges I want to participate in. I think I got them down pat! So this challenge is for the Favorite Punch or Die Challenge at ABC Christmas Challenge. What a fab idea they had! I'm not sure when the challenge started but it was... guess... based on the alphabet! Purpose was to make 26 Christmas cards by Christmas. They are up to the letter "Y"... which is where I come in. I only just today found it. :) Had I only known! This is my card for the challenge at ABC Christmas Challenge. 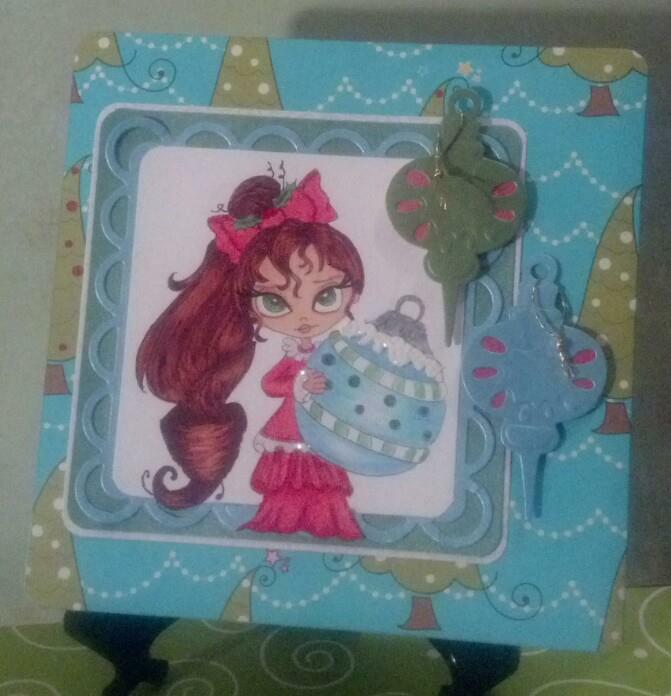 I used Spellbinder scalloped square and Christmas ornament dies. Who wouldn't like a square scalloped die? It is so versatile! That's how I feel about the square and circle dies I have. Oblong and rectangle too. You can use them for anything and everything! Love them! Then... who wouldn't love anything Christmas-y? I always have a hard time passing anything up that's Christmas-y. :) The stamp is from Scrapbook Stamp Society and I used Copic and color pencils to color the image. I also used my favorite Crystal Snow from Stampendous on the "lace" edging on the dress. I used Liquid Applique on the top of the ornament because the ornament reminded me of some we had when I was younger... back in the... you know what? It was when I was younger. :) I almost AGED myself there! Anyway, the ornament did bring back memories... they had embossing that looked like snow. So I embellished the ornament on the image to look like the ornaments of yesteryear. 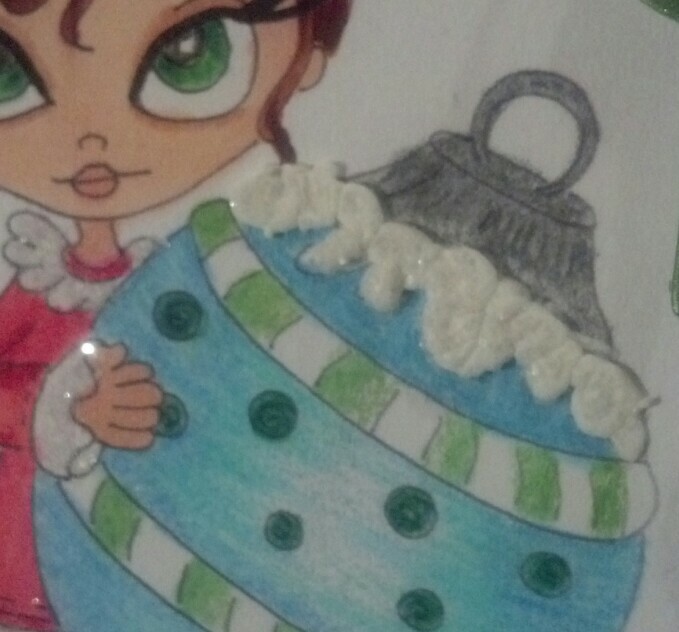 :) The image is Susie Lou Christmas Ornament Ragamuffin. Get this... she's $1! Yup! They have about 123 $1 digis! Isn't that awesome?!? I had to stop myself at $19... Had. To. Make. Myself. Stop! I strung gold cording on the Christmas ornament dies... they are ready to be hung! :) Here is a closer look at the snow-capped ornament.